If you have a few days in Kagoshima then spending one in Kagoshima city, and one visiting Sakurajima Volcano makes a good itinerary. The volcano is still active, and on some days sends smoke over Kagoshima. To get there take the Sakurajima Ferry. 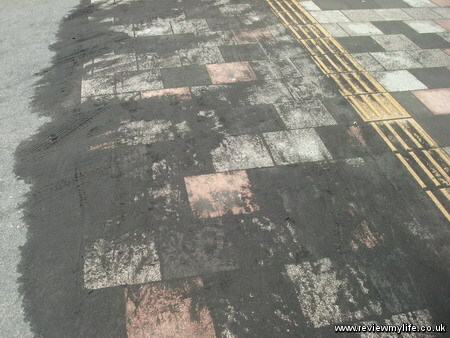 This leaves from Kagoshima Port ever 10-15 minutes for most of the day, and ever 30-60 minutes outside of peak hours. 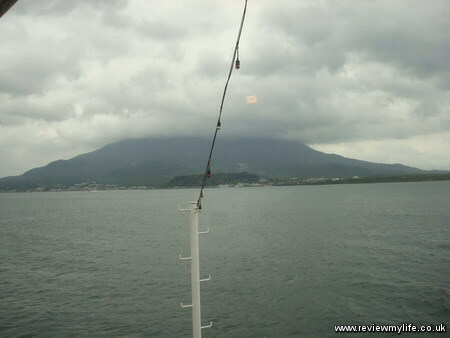 The journey to Sakurajima Port is only 15 minutes. For adults the ferry fee is ¥150 and ¥80 for children and you pay when you reach Sakurajima. Some of Sakurajima’s sites are located in easy walking distance of the port, but for others (especially the various view points) you’ll either need your own car, or to take the sightseeing bus. 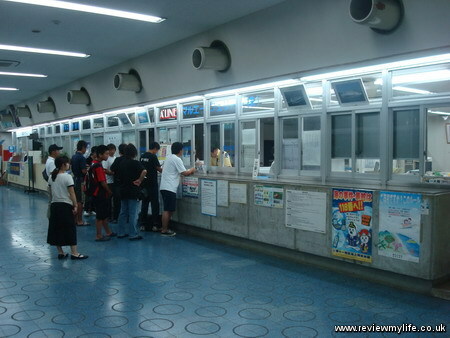 There is one bus in the morning and one in the afternoon at 9:40am and 14:20pm departing from Sakurajima Port. The trip lasts two and a quarter hours. The tickets are ¥1700 for adults and ¥850 for children. This was correct as of August 2010, make sure you check the departure times, and cost before you go! On the bus there is a guide who gives commentary, but all in Japanese. Fortunately if you can read English there is a translated text version of the talking. The guide will tell you which bit he/she is up to at regular intervals. As the bus takes you round you can see the volcano from various angles. 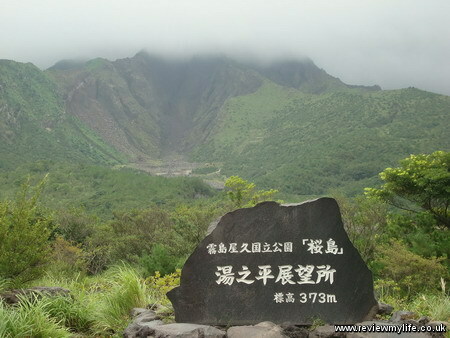 One of the stops is at the Yunohira Observation Point from where you can see the effect the volcano has had on the landscape. There are two buried Torii gates along the way. Here is one of them that we stopped by. 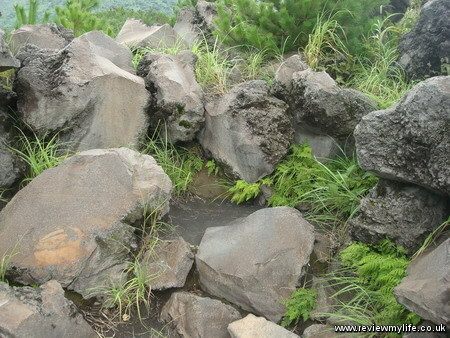 There are plenty of volcanic rocks formed from past lava flows along the way. Here are some examples. The bus then drops you back at the ferry port. If you want to nearby visitor centre make sure you plan it in as it closes early (I think 5pm). 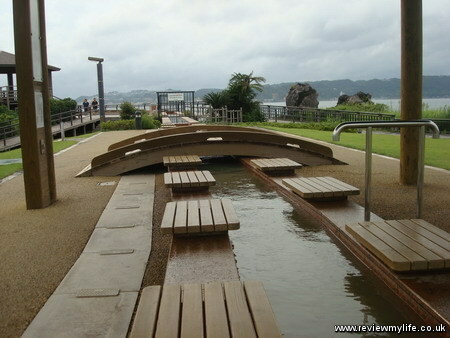 Between the visitor centre and the sea if the Yogan Nagisa Park Foot Spa. 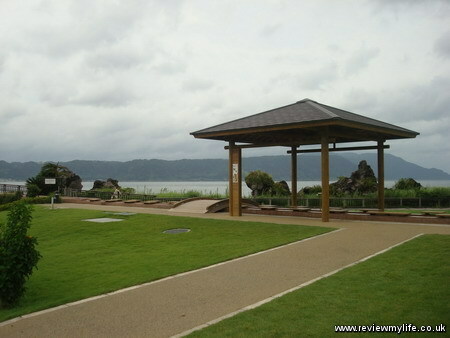 From here you can soak your feet in fresh natural hot spring water. It is free and you can get a good view of the bay while you relax. There are other attractions on the island if you have more time such as the Sakurajima Dinosaur Park and several hot springs. 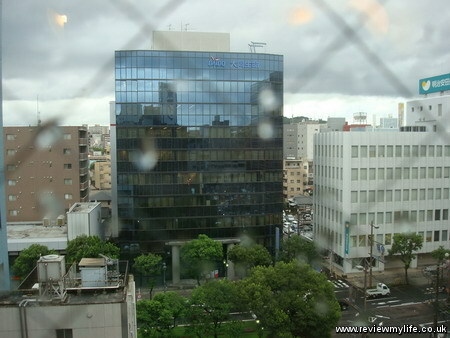 We arrived in Kagoshima via the Naha to Kagoshima ferry and took the shuttle bus to JR Kagoshima station. 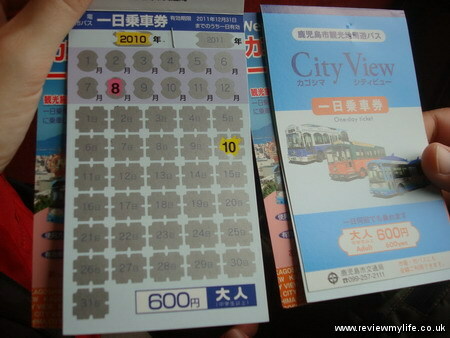 At the station we picked up the very useful ‘An Insider’s Guide to Touring Kagoshima’ from the tourist information, and also bought a City View pass for ¥600 which would allow us to use the Kagoshima City View buses and the Kagoshima City Tram. First we took a ride in the ferris wheel on the top of the Amu Plaza shopping centre next to the station. 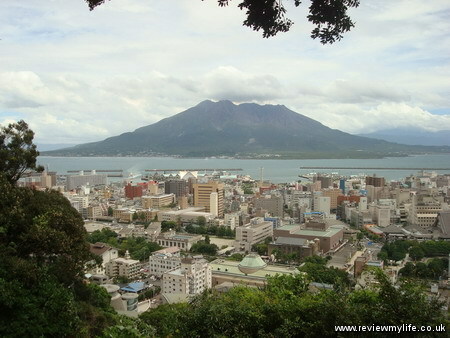 From the wheel you can get a good view of the city, and the Sakurajima Volcano which is across the water. The volcano is still active and regularly sends smoke into the air. Next we got the City View bus to the Sengan-en garden which contains plants, water features, and various artifacts, such as this cannon, and model ship. The garden was built during the Edo period in 1658 and was a second home for the Shimazu family, who ruled the Satsuma domain. You get some great views of the volcano from the gardens, but for a slightly different view you can go to the Shiroyama Observation Point. Again this is one of the stops on the City View bus. 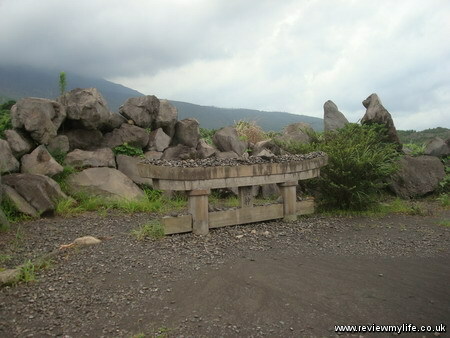 The volcano’s presence is everywhere, from the views you get of it through much of the city, to the black ash which is all over the pavements. 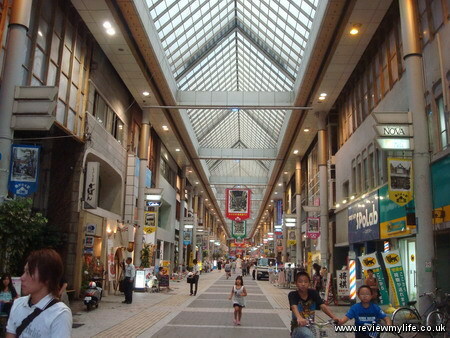 There are plenty of shops and cafés in the city’s large covered shopping area. Here is a view of part of the city at night with the usual Japanese bright lights. 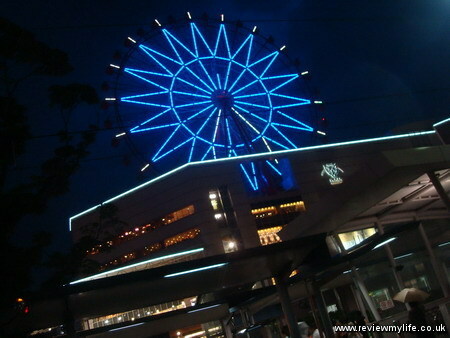 And finally this is the Amu Plaza at night with the ferris wheel. 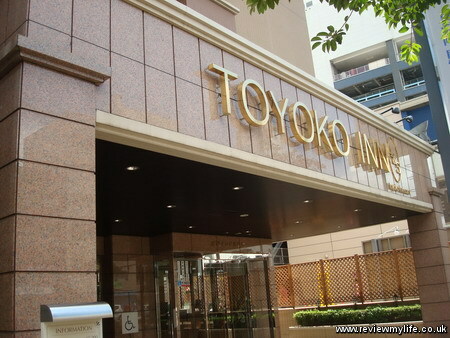 There are some good restaurants (including Indian and Italian if you don’t like Japanese food!) on the top floor of the Amu Plaza. There is also a cinema, clothing shops, and a food court. 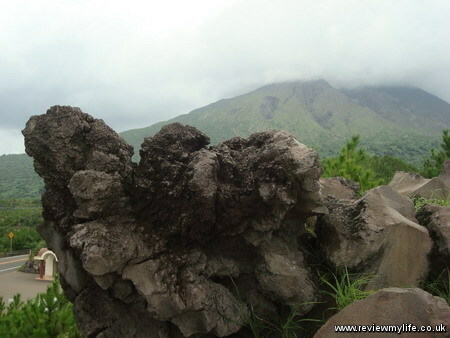 For more on the volcano read my post on visiting Sakurajima Volcano. 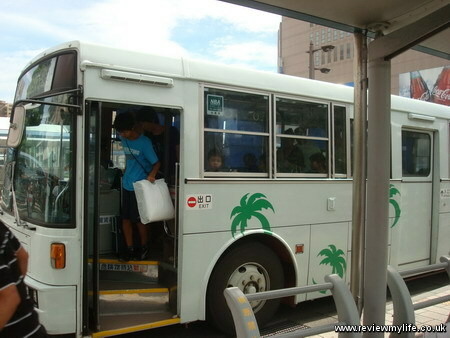 To get from Naha to Kagoshima you can fly or you can get a 25 hour overnight ferry. I decided on the Naha Kagoshima ferry option. 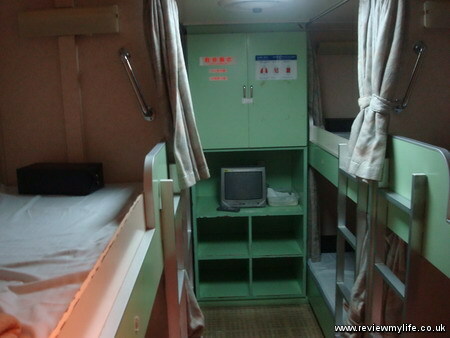 It cost ¥16,200 for the one way journey, staying in a shared cabin with 8 bunk beds. 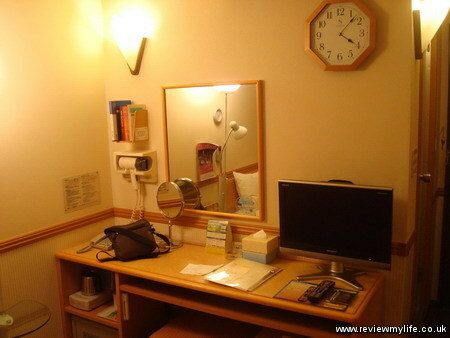 ¥14,200 was paid when I booked the ferry at the KNT travel agent in Japan. 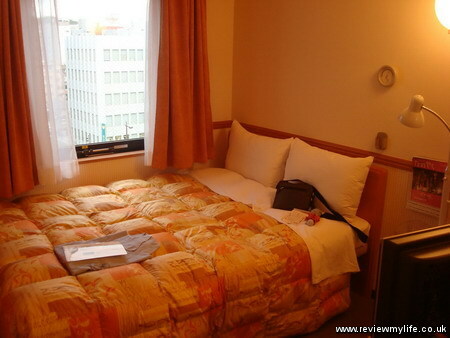 And ¥2000 was to be paid at the ferry terminal as a supplement for having a room, rather than sleeping on the floor. I booked in advance, but you can buy tickets on the day as well. I think the ferry had plenty of free space when I went (early August) – especially in the cabins. My day started early as I had to be at the ferry terminal between 6am and 6:30am to check in. 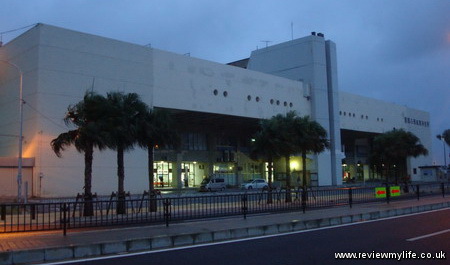 Naha has quite a few ferry terminals on this side of the island. My ferry was leaving from Naha port near Asahibashi monorail station. Inside I went to the check-in area. At the check-in I had to present my booking confirmation and fill in a form (‘Boarding Application’) with my name and a few other details. I had to ask the person behind the counter for a cabin, and then I paid the extra ¥2000. No one seemed to speak English here, and all the signs were in Japanese, so make sure you get here early so you can get everything sorted. 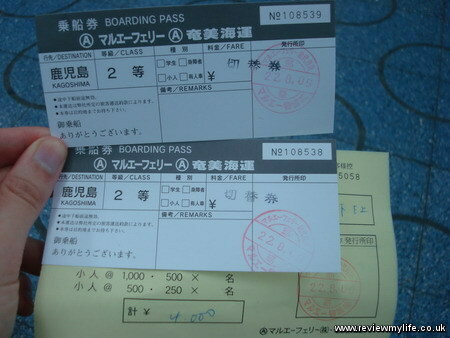 After I had filled in the form I got my boarding pass. The bits at the front get you onto the boat. And the yellow bit at the back shows that I have paid extra for the cabin. Boarding was at 6:30am so I still had a little time to wait. There is a shop inside the port building if you need any last minute food or drink. At about 6:30am I queued up with the others to get on the ship. 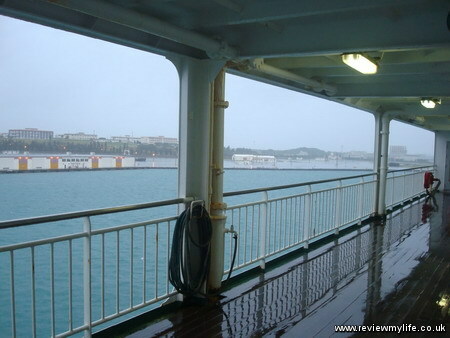 It was raining and very windy so I had to make a run for it across the concrete to the ships stairs, and then get up the stairs as fast as I could! This ship was the フェリーなみのうえ (Naminoue Ferry). Inside I showed my ticket to one of the staff. 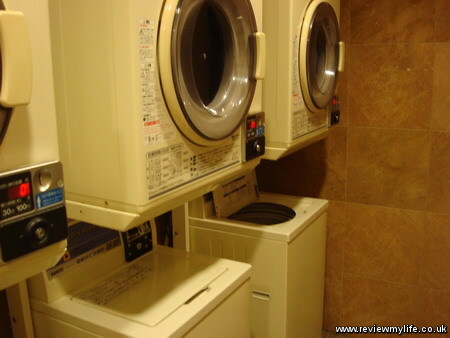 He told me where the room was in Japanese, but as I didn’t quite understand he lead me to where it was. 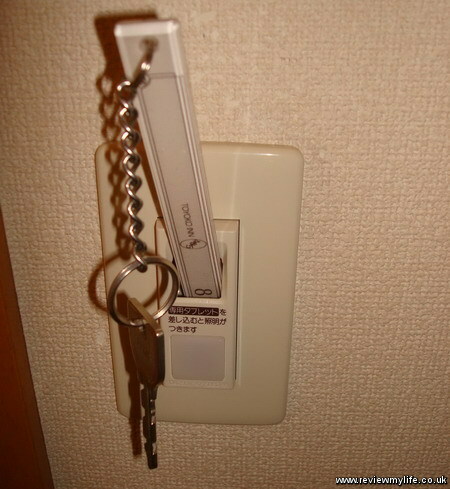 They don’t give you a room key, the room just stays unlocked the whole time. 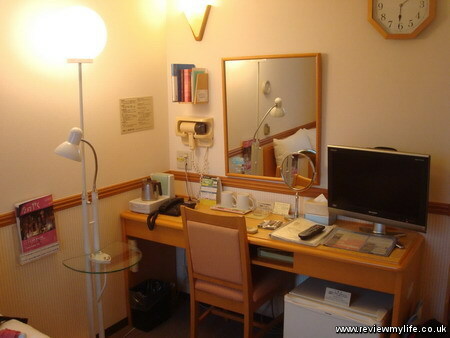 This is the inside of the room. 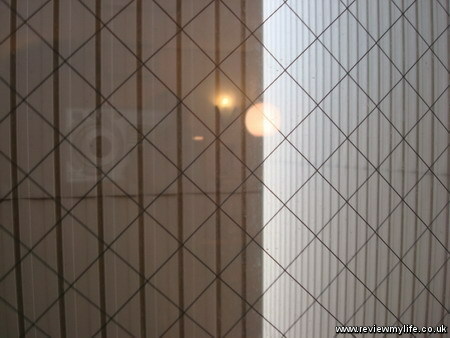 Not visible in the picture on the ceiling is a control for the air conditioning, and another for the speaker volume. I recommend you set the volume to ‘1’ so you hear the announcements without being startled. Here is a closer look at one of the beds. There is a light, a hook, a fold-up net shelf, a blanket, and a black leather looking box. That black box is your pillow! It is fairly solid, and feels higher than a normal pillow. As it was quite hard I found that I couldn’t lie on my side as it squashed my ear! They do supply paper covers for the pillows for ‘hygiene reasons’, but I found it more comfortable to put the pillow in an old t-shirt. At this stage of the journey I was the only one in the cabin. 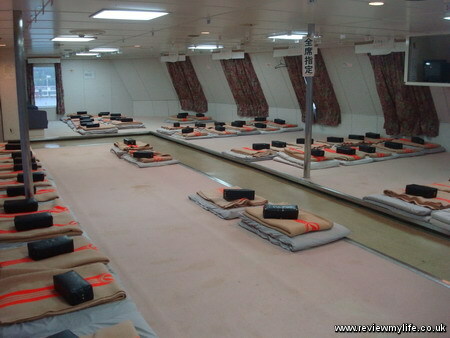 If you don’t want to pay the cabin supplement then you get to sleep in one of the large communal sleeping rooms. Each space is numbered so you’ll know which one is yours. Then the ship set sail. There isn’t very much to do for the 25 hours. You can walk on the deck, there is an upstairs deck as well. You can sit on the seats or carpet watching the sea. Or you can walk around the two main floors. The upper floor had the cabins and a few communal sleeping rooms. The lower floor had the reception, ship, vending machines, some arcade games, and another sleeping room. Canteen style meals are served in either the main restaurant, or the breakfast restaurant. You can buy ramen, curry rice, udon, plain rice, tofu and salad. You can also get food and drinks from the small shop and vending machines. The overall food selection isn’t great so you might need to bring some of your own food. Every three to four hours the boat would pull into another island. Once docked people would leave or board. Fork lift trucks would spring into action taking cargo crates on and off the boat. Before the last stop of the day a member of the crew came into my cabin and told me that someone else would be joining. 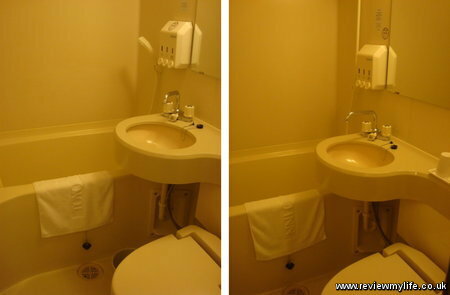 Twenty minutes later a Japanese man came in and claimed his bunk. I got quite a good sleep on the ferry, much better than my experience on the overnight Bari to Patras ferry that I took some years ago. From that experience I’d learnt that bringing an eye mask and ear plugs is a good idea if you have to share your sleeping space with strangers. 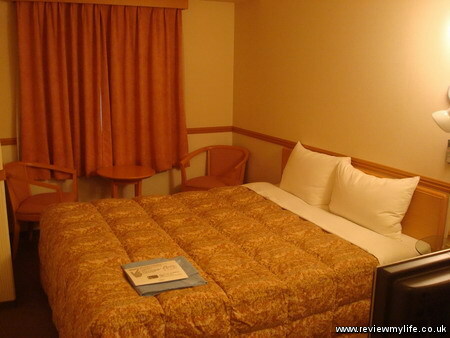 Fortunately the Japanese man was very quiet, and the rocking motion of the ship sent me to sleep. On the reception they update a notice saying when the ship will dock in the next port. Kagoshima was the last stop. 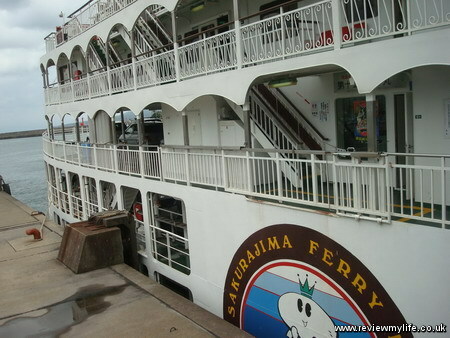 The ship was supposed to get into Kagoshima at 8:30am and at 8:40am I was able to leave the boat. I had to give my tickets to a man on the way out – so don’t throw them away when you get on. Outside the ferry was a paid shuttle but that took me to Kagoshima JR station. One word of warning – after being on a rocking boat for 25 hours I found that I were a bit unstable on my feet for the morning and a bit into the afternoon once I’d disembarked. It was as if I was still on a rocking boat. Allow yourself a bit of time to adjust to solid land again. 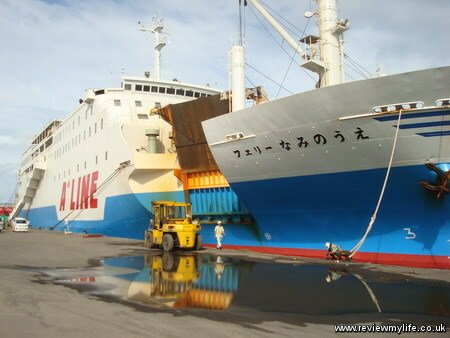 More details on the Naha to Kagoshima ferry route are available from the A-line ferry website. You might also hear this company being referred to as ‘Marue Ferry’ group. Specific information on the ship I sailed on can be found here. 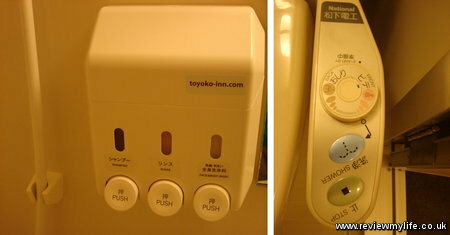 Using Google Translate may help to make more sense of it.